Pictured above is an amazing image of an Iatmul Elder as captured by Anne Gordon, one of the members of our writing co-operative – Edgehill Press. Anne received a tie in the Bronze category for ‘Special Focus Travel Articles’; her article ‘Land of the Last Frontier’, about the Sepik river and the Iatmul in Papua New Guinea was set beside Christine McBeath’s article ‘ Kickboxing in Backstreet Bangkok. Anne recently edited the book ‘Caving in Ontario; Exploring Buried Karst’. 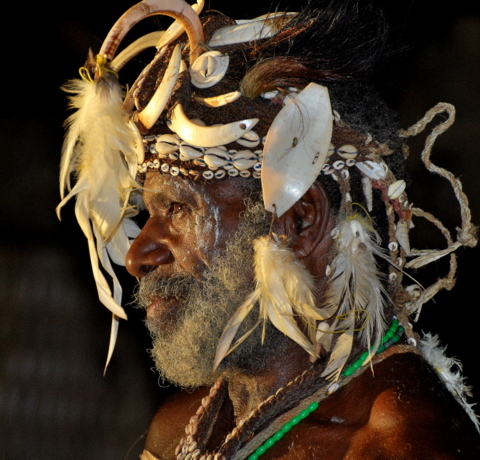 The Iatmul live on the banks of the Sepik River, believing that their ancestors were born from a hole in the mud somewhere up river and they were washed down to their present location in an enormous flood. Life in an Iatmul village centers around the spirit house into which it is normal practice for only initiated warriors to be able to enter (under pain of death). To the Iatmul, their whole world is supposedly perched upon the back of a giant crocodile – this being said, they follow a crocodile scarification procedure that leaves a pattern on the back of the recipient that has a resemblance to crocodile skin.